Anne-Hélène & Bernard are professional dancers, instructors, choreographers & performers, specialized in swing & blues dancing, couple or solo dances. 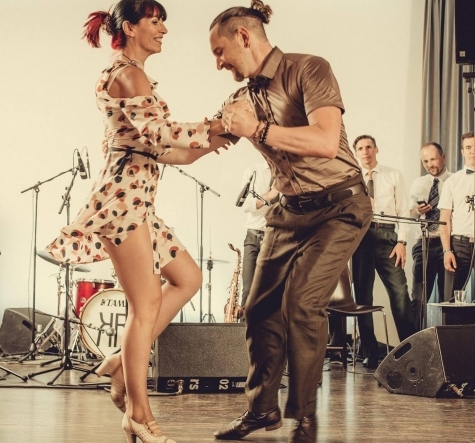 Anne-Helene & Bernard fell in love with Swing Dancing by the end of 1997… since there, they dance Lindy Hop, Balboa, Blues, Charleston & Jazz Roots almost every day. Because of their special background (anne Helene is a dancer since she was 7 years old in ballet, modern jazz & contemporary, when Bernard started to be a musician and a sportsman) they became quickly known nationaly, and then internationaly. They started to teach and spread their passion in 2001. From there, they have been asked to teach in international workshop all over the world: USA, Canada, Australia, New-Zealand, Korea, China, Japan, Taiwan, and all over Europe : Sweden, England, Scotland, Netherland, Germany, Belgium, Switzerland, Austria, Finland, Slovenia, Spain, Italia, Russia, Ukrainia … and everywhere in France ! Anne-Helene & Bernard are also organizers of big workshop and festivals: from 2001 to 2004 the pink city swing or balboa festival, since 2003, the Studio hop summer camp, and the frenchie balboa festival, then the Crazy Rhythm Challenge, Hot Blues….